MESA’s vintage-voiced Fillmore 25 offers 6V6 power in a 2-channel, compact Boogie sized head or combo format. MESA/Boogie is excited to announce the addition of the Fillmore 25 guitar amplifier and Fillmore 19 cabinet to its line of products built in the company’s Petaluma, California shop. Watch a video below to find out more. 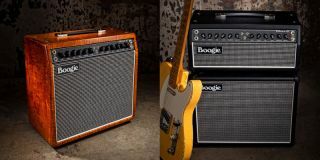 MESA reports that the new vintage-voiced and styled amplifier is inspired by the award-winning Fillmore 50 design and the many early design discoveries at Boogie. The company's goal with the Fillmore 25 is to offer a model with a unique vintage voice and tonal character achieved only with 6V6 power. Another key feature of the Fillmore 25 is its compact 19” traditional Boogie sized footprint. Style and design elements remain true to the award-winning Fillmore 50 and the optional Fillmore 19 Cabinet is the perfect complement to the new smaller 25 formats. Similar to the 50, the 25 is presented in a simple 2 (identical) Channel, 3-Mode platform. Different from the 6L6-powered 50, the all-tube Fillmore 25 is powered by 2x6V6 Power Tubes and features 5x12AX7 Preamp Tubes. A refreshingly streamlined front panel showcases 2 fully independent foot-switchable channels. Identical by design, via MESA’s 3 Mode Channel Cloning, both Channels 1 and 2 feature Channel Cloned Clean, Drive and HI Modes, with Independent Gain, Treble, Mid, Bass, Presence, Reverb and Master Controls creating versatility far beyond most 2 Channel offerings and many ways to configure the channels. MESA’s Vintage all-tube, long-tank, spring Reverb with independent channel controls and a fully buffered, series tube FX Loop round out the Fillmore 25 feature set. Additionally, Reverb switching can be handled remotely with an optional reverb footswitch and cable offered separately. “We have something really special with the Fillmore 50 and the accolades continue to pour in so I think this definitely confirms that we headed in the right direction for a vintage-voiced Boogie Series. Throughout the Fillmore 50 development phase, our excitement continued to build when considering the potential of a lower watt, compact version with the unique qualities of 6V6 power. The result is the new 25 and what we feel is an amazingly compact format with vintage voice and the preamp flexibility to cover any style. Authentic traditional tones abound in the 25…everything from clipped cleans, to a purring grind, all of which are joined by the preamp’s higher gain realm delivering blistering tube overdrive like only a MESA can! Ultimately, the 25 tone experience can best be described as the Fillmore 50’s circuit, soul, and clip-ability coupled seamlessly with the realm beyond where traditional amp evolution tapped-out in the twilight of the '60s!” said Doug West, Director of Marketing at MESA/Boogie. To complement the new Fillmore 25, MESA is introducing the Fillmore 19 cabinet to the Fillmore cabinet series. Similar to the vintage tuned 1x12 Fillmore 23, and 2x12 Fillmore, the Fillmore 19 1x12 features a higher, tighter bass response that is perfectly suited for the vintage-inspired Fillmore tone. Made in Petaluma, California, Fillmore cabinets are constructed from Marine Grade, Baltic Birch with rear mounted UK-made Celestion Custom 90 speakers and their open-back design is vintage-inspired focusing on size, tone and portability. As with all MESA products, a full range of custom options is available for the Fillmore 25 and Fillmore Cabinets. To learn more about the Fillmore 25 guitar amp and Fillmore cabinets from MESA/Boogie, visit mesaboogie.com.